I adore them where you have them!!! I love it too but then I do love sea turtles! Makes me think of watching the young turtles race for the ocean after popping out of their nest. As zozee said, I too think I would move them around a bit to spread them apart some. Maybe have one really close to the "water". Also as zozee said, it's better to have an odd number but I would add one more because as I said I love sea turtles! This is going to be a great quilt! Love the way it looks.....add the turtles, it looks like they’re swimming back out to sea. I think it brings more life to your already beautiful quilt top! It's wonderful! Go for it. I think you need to keep the turtles - they give the quilt a lot of spark. I love it! We have a vacation home on Anna Maria Island in FL. Someday, we will be snowbirds. This quilt depicts that beach perfectly! Sand to aqua water that gets darker as it gets deeper. And turtle preservation is a huge deal there. We were able to see a nest hatch and make their way to the Gulf. This quilt reminds me of that night. It’s a beautiful quilt no matter what you decide. The turtles add a bit of balance although I think I agree with Zozee that 3 might be enough. I would check to see how they will fuse. I might make a sample turtle to fuse first over a sample seam background to see if you get the lines and shiny spots from the iron. You might want to trapunto the turtles with a light batt under then and needle turn and stitch them on. I think the turtles look nice but I am too practical. When I spend a lot of time ona quilt, I want something not trendy- and also something I would not get tired of over time. Personally, I think your quilt is fine without them. Love the turtles on Maui - agree with Zozee that 3 might be a more pleasing arrangement and perhaps just having the mother turtle barely into or already into the water with the two babies heading that way? Breaks it up but still tells the story? JMHO. By the way - I am certain it will be fabulous however you choose to finish it up! Those turtles want to be on your quilt!!! I like it just the way it is with the four turtles. Actually, to me, there is one turtle and then 3 smaller turtles. As has been said about design......things look better with an odd number.........and I agree. Hence my comment about 1 and then three. PS: I really like that quilt design. Love that! It is beautiful!! If I changed anything, I would put the babies closer to the mater than the mom. Maybe like others say, one in the water. I recall that when I saw your quilt the first time that I commented that I really liked it because of the color placement in the Storm at Sea pattern. I do think the sea turtles are very heart warming. However, like one other person mentioned, I would be very concerned about adhering them to the quilt because of the seams in the quilt and the layers of fabric in the turtles. I would make a sample of the patchwork and another sea turtle and see what happens. If it meets your expectation, you could use it as a pillow or a sham. If it does not...you won't have ruined your beautiful quilt. Please share with us what you decide to do. I shall be the contrarian here. I like the quilt too much to add turtles. 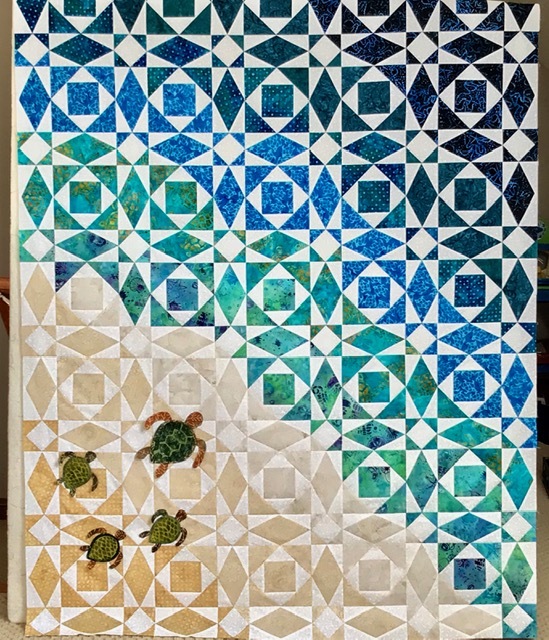 I know we can all fall back on the the "it's your quilt do what You want to do" comment but I would like to add that if you are feeling uneasy about adding the turtles, pin them on and hang the quilt on you design wall and walk away for a few days. Then follow your heart. The quilt is too lovely to not finish it perfectly. Don't hesitate! Sew them on, just like you have it. They are a great touch to a stunning quilt. Can't wait to start mine.